Map of SRJC district areas. Photo courtesy of Sonoma Gazette. The Sonoma County Junior College District (SCJCD) board of trustees is waiting on a study from SRJC President Dr. Frank Chong on a redistricting proposal to split up some of the SCJCD’s trustee voting districts. 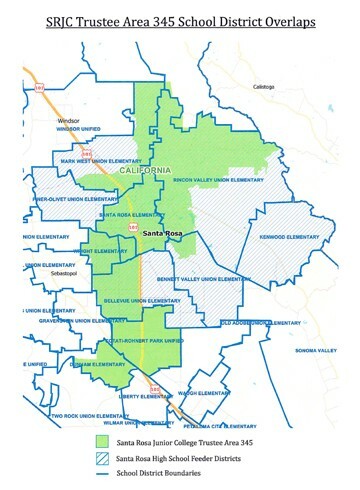 Santa Rosa Junior College Board president Jeff Kunde commissioned the study to explore options for changing district boundaries to divide District 3-4-5 into three separate voting districts. “I am still working on the fact gathering for 3-4-5. It is a complex issue and a complex process. I have been meeting with redistricting experts, county officials, Sonoma County Board of Education and students to better understand this issue,” Chong said. The district is currently divided into five trustee areas. Four of the districts (1, 2, 6, 7) are single trustee districts representing approximately 70,000 Sonoma County residents. The fifth district, commonly referred to as District 3-4-5 is an at-large voting district that represents 200,000 Santa Rosa area residents. District 3-4-5 is three times larger than other districts and starts in northern Santa Rosa and extends south to Rohnert Park and Cotati. The board held its first public forum on March 25 to hear public comments on the redistricting issue. Community organizations and student leaders presented arguments for redistricting, contending that the current structure does not fairly represent the large Hispanic population. Reform advocates claim the at-large system weakens minority voice in 3-4-5 – particularly for Hispanic residents who make up 30 percent of the area’s population. There has only been one Latino representative from 3-4-5 since 1965. “As a resident of 3-4-5 you have three points of access, whereas the other districts you don’t. 3,4,5 costs more to file a candidate statement, two or three times as much,” said Jessica Jones, a former SRJC student body president who has advocated for redistricting for three years. The high cost of filing a candidate statement and running a campaign in the geographically large 3-4-5 district can prohibit less affluent community members from running. The Student Government Assembly (SGA) approved a motion Aug. 31 reiterating its support for the 3-4-5 redistricting initiative. Chong said he is committed to providing the board with a report with recommendations and options for redistricting by no later than the end of the semester. “The best thing to come out of Chong’s proposal is a project timeline,” Jones said. There are two likely routes to redistricting. The first would call for an election where 3-4-5 residents would vote to redistrict to single trustee districts. The second would be for the board to submit a waiver to the Chancellor of California Community Colleges to bypass the election and approve the new districts. Once the Board receives the study, members will review the redistricting information and make a decision on what to do. Redistricting 3-4-5 has broad support from organizations in the community, such as the Sonoma County League of Women voters, the Sonoma County Democratic Party, and the SEIU Local 1021. As a formerly elected SRJC Bd. of Trustee member from Dist./Areas 3, 4 and 5, I applaud the efforts to redistrict this huge area. It is truly an overwhelming task to run a fiscally feasible campaign and to “walk” the district to meet the constituents. Thank you for this excellent article!